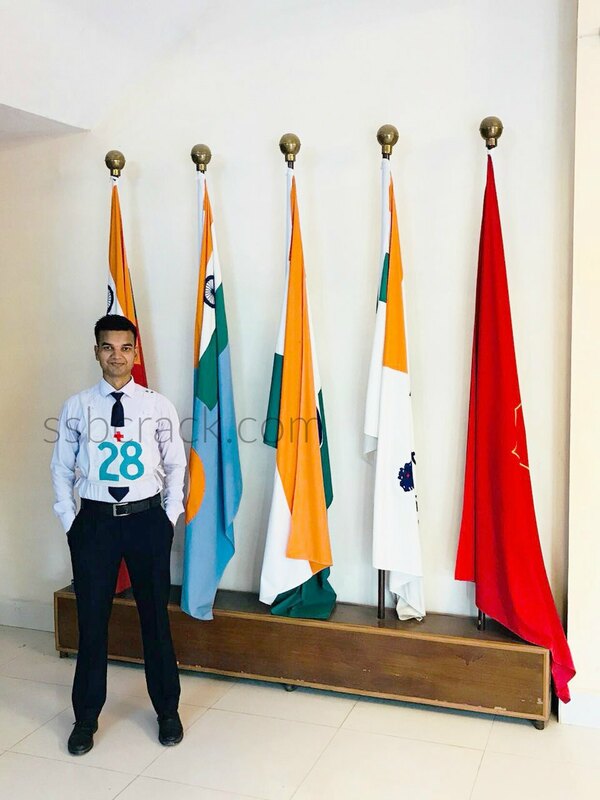 Hello, friends I am Rohit Rawat from Dehradun Uttarakhand, recently got recommended on 02 may 2018 In my fifth attempt for NCC-44 (M) special entry from 34 SSB Allahabad with AIR-23. The journey started on 28 April 2018 when I reached SSB centre with my friends at 6.00AM. Total reporting was of 136 candidates and we were allotted 34 SSB. SCREENING DAY – 28 APRIL 2018 – I wrote almost all the questions in OIR test. In PPDT the picture shown to us was an elephant half merged in water with four people on his back and a background of village partially merged in water. I made a practical story on the rescue operation and wrote well in time, I also narrate the story well with confidence and fluent tone and in GD I spoke only twice and gave the valid points for group progress. After an hour of waiting the results were declared and total 44 candidates were screened in out of 136 and I was chest number 28. For screening, I would like to tell that try to attempt OIR as much as you can at least 80 + out of 100 with a good story relevant to the picture and a good narration with a healthy discussion. DAY-2 PSYCHOLOGY – I wrote all the TAT stories, attempted all 60 WAT, 39 SRTs and completed my SD well within time limit. For psychology part, I would like to suggest that try to match the personality of your TATs character with your SD and PIQ and in WAT response should be such which you have faced in your daily life and in SRT solutions should be short and brief. EX- If you write RESPONSIBLE in your SD then it should depict in your TAT, WAT, and SRT. The most important thing in SD to deliver your qualities by actions or deeds you do in your everyday life avoid using an adjective as much as you can. GTO DAY-1 – GTO gets easier when the group is cooperative, when you have decent knowledge regarding topics and you are good at communication skills with all these, I participated actively in both GD and spoke 3-4 times in both the GDs. I would like to suggest speaking with confidence and before speaking arrange your points in chronological order to be an effective participatory and try to be a good listener also. Listen to others points as well, sometimes they give you new ideas for your own points. In GPE I observed the planning board properly, read the narration part and wrote my plan effectively within given time period and also participated actively in GD and come to a common group with my group. For GPE observe the board and while writing your plan mention time, distance and resources and also utilize your group effectively to overcome all the problems. In PGT I gave my ideas from beginning to till the end and also supported my group if any other bide to apply his idea. Always work cheerfully while doing any task. In GOR I cheered my group with the “HAR HAR MAHADEV” and enjoyed the whole task. In HGT did not get the idea but as a team man, I supported my group mates in completing the task. In LECTURE I spoke on the topic NAXALITE PROBLEM in India for about 3 mins. Completely with good content, pitch modulation or tone. Do Practice in front of the mirror and front of your friends to become a good orator. GTO DAY-2 – In individual obstacles, I did 11 obstacles without doing any foul. In COMMAND TASK I was the second called for CT got a round task to solve with three approaches with my subordinates I completed with all the three possible ways as told by GTO sir. In FGT I gave my ideas to overcome the obstacles and completed the task within 5 to 10 minutes with my group. INTERVIEW – I was called for the interview at the last after GTO day 2 my interview went only for 10 minutes with 13 to 15 questions asked by interviewing officer from PIQ related to my family, my studies, my friends and my goal in life. I answered every question confidently with good communication skills and expressed my views effectively. For the interview, I would like to tell that analyze your PIQ form as much as you can and try to bring out all the possible questions from the PIQ and prepare the answer. Self-introspection is the best way to prepare your interview, effectively because all the questions revolve around us. CONFERENCE DAY – 02 MAY 2018 – being the chest no. 28 I was called at the end of the conference. I waited for 5 to 10 minutes before my conference. I entered in the hall with a good posture and wished the president and he told me to sit. My IO asked me about my performance in the SSB and told me to rate and I replied my reason for this. Next question was why this attempt is different from last attempts. I answered that the implementation of my planning and preparation is as it is, as I planned. Then he asked me about the stay and all and I answered him properly. RESULT – Result was announced after 20min we all were waiting with excitement. Sir came to the waiting room and told only one candidate has made this time. I was shocked after hearing this word. Then he announced chest no.28 and I was in dilemma it is mine or not then everybody was looking at me, then I felt yes it is me. I spelled my name and chest no. The dream come true, my preparation took 3 yrs to achieve the destination which I want to achieve. All the very best everyone. Do well to get well. Hope you all will join the force soon. PURPOSE, PREPARATION, PRACTICE, PERSISTENCE, PERSEVERANCE, PATIENCE, PROGRESS. THESE ARE MY 7P’S FOR SUCCESS.